Stand on the hill where legendary Acropolis is located and watch the Athens’ beauty up on this hill while thinking about the grief, victories, defeats and the deep history of this legendary city of Greece. 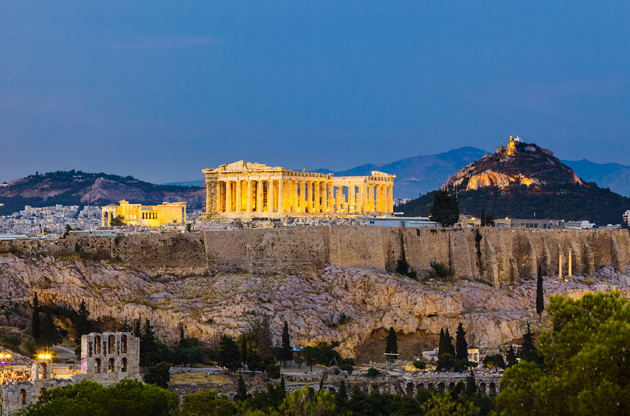 The city of gods, goddesses, the birthplace of democracy, theater, the city of temples, the history, the cradle of the Western civilizations and one of the most ancient cities in the world, the capital of Greece, Athens is nearly 3000 years old. The mythology is real and the history is alive in this city. Wherever you look, you see the Roman and Hellenistic remains. You feel the inspiring spirits of Aristotle, Homer and Socrates and you can swear that Zeus is watching you somewhere up on the hill with his beloved Hera. When you leave your thoughts about the history and the mythology, the modern life of Athens flashes in front of your eyes. You start hearing Syrtaki melodies, smelling the aniseed of Ouzo and feeling dizzy because of the magical impact of the traditional Greek colors blue and white. With the beautiful seas, dreamy islands nearby, picturesque streets, delightful tastes and the deepest history in the world, the pride and joy of Greece, Athens have so much to be inspired. The capital of Greece, Athens is located in the southeastern part of the Greece. The busiest airport of Greece, Athens International (Elefterios Venizelos) Airport is located 27 km northeast of Athens. If you want to have more information about the transportation options from the airport to the city center, you can visit the official website of the airport. The 2500 years old Acropolis will shower you with the history. Walk up the hill to feel yourself as a god or a goddess watching the beauty of this magical city up from this hill. In Acropolis you will also have the chance to see the world famous temples which are Parthenon, Erekhtheion, Propylaion and Temple of Athena Nike. Do not miss the chance to see the symbol of Greece. Panathenaic Stadium that hosted the first Olympic Games in 1896 is located in Kotzia Square and it is one of the most famous attraction points in Greece. Protecting a huge Zeus sculpture that is made of gold and ivory, the temple is located in Syntagma Square which is considered as the most important square in Athens. One of the most popular regions in Athens, Kolonaki is the modern and luxurious face of Athens. You can enjoy luxury shopping and dining at first class restaurants as well as visiting the museum that exhibits the 2500 years old pieces from ancient Rome and Hellenistic period. With its narrow streets, taverns, antique shops and traditional Greek houses, Plaka is a typical Greek neighborhood. It is also the perfect destination for the nightlife and shopping. Having the largest Greek art pieces collection in the world, National Archeology Museum deserves your attention. The sculptures inside exhibit the sculpture art chronologically. Located in the south part of the Acropolis, The Acropolis Museum exhibits the richness of ancient Greek culture. If you are looking for souvenirs at reasonable prices, the shops in this area will help you a lot. You can buy t-shirts, knick knacks and handmade toys either for yourself or as souvenirs. If you are a close follower of European fashion, the design stores of world famous brands like Gucci, Louis Vuitton and Bulgari will welcome you with their remarkable collections in Kolonaki. Ermou is the place that you should go if you are looking for high quality shoes and clothing. This area is closed to traffic and you can enjoy shopping with the melodies of street musicians. What is more, the real treasure that you can find while shopping in Athens is that the craftsmen’s shops located in the apartment buildings in these regions. If you know the value of handicrafts, these shops will offer you much. In Greece and in Athens, taverns are the first choice both for dining and an entertaining night. These traditional restaurants offer you the delicious Ouzo, stimulating Greek music and best tastes from Greek cuisine. Both tourists and local people prefer Greek taverns when they want to dine out. Yoghurt with walnut and honey, Saganaki (kind of fried cheese), Tzatziki (made of yoghurt, cucumber and garlic), grilled calamari filled with cheese and Moussaka are the top tastes that you should definitely try. Going to theater is undoubtedly the other most popular activity in the birthplace of the theater, in Athens. The National Theater puts the most remarkable plays on the stage. However, Petra Theater in Petropolis presents English plays. This restaurant may not offer you a first class ambiance, however we promise that you will never forget the tastes that you have here. To experience one of the most remarkable moments of your Athens trip, pay a visit to this restaurant located in Singru Avenue. Located in Adrianou Street in Monastraki, Kuzina offers you great tastes of Greek cuisine under an enchanting ambiance. If you want to dine at restaurant from the Michelin Guide, one of the best restaurants in Greece, Kuzina will satisfy you much. Feeling energetic? You can dance and dine in the taverns located in Psirri Region. Live Greek music is in every tavern to turn you on and you will undoubtedly experience the best Greek experience in these taverns. If it is the season, you will have the chance to get into the blue and white on the stunning Greek Islands which are Hydra Island, Poros Island and Aegenia Island. If you have one more day to spare yourself, the Greek Islands, the most famous attraction of Greece will make you feel refreshed. The cradle of Western civilizations and the democracy, Athens provides with a perfect atmosphere for international meetings. Being so rich both culturally and historically Athens undoubtedly inspire the sector leading events like conferences, congresses and symposiums. Thanks to hosting the Olympic Games in 2004, most of the hotels went under construction and now serve with a high capacity and modern facilities. The transportation network was also renovated and now provides easy access to each corner of the city. International large scale gatherings like trade shows, fairs and exhibitions in Athens, the capital city of Greece are numerous each year and draw global attention.